I was a little skeptical. I’ve never done or seen a “color run” but I know many of my daughters’ friends have done them and loved it. Just seemed like a big mess to me but, whatever. To each his/her own. But then I heard about Just Add Color. The lights went on and I thought – YES! For this former birthday party organizer and entertainer, this seemed like the perfect idea! And it is. Just Add Color was the brainchild of a creative dad who took his experience with the product back to where it’s the most fun. HOME! And it’s excellent! 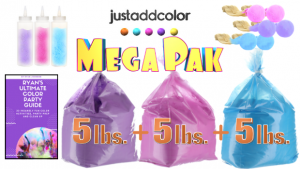 When you order your Just Add Color party pack, you get TONS of color dust. It’s a LOT! So you can do all kinds of different activities with it and still have more for another party. Seriously! This is awesome, you guys! The party pack comes with a fabulous idea book and if you need more ideas, Ryan is keeping a list and is happy to share the other fun ideas he and other customers have. The possibilities are endless and that’s why having ALL THAT COLOR in your party pack is so tremendous. After your first party you’ll WANT to have another… and another! Check out what you get in your party pack… I’m telling you it’s a TON! A booklet/guide for ideas of how to use the powder for your party – so many great ideas! 3 bottle “paintbrushes” – awesome! 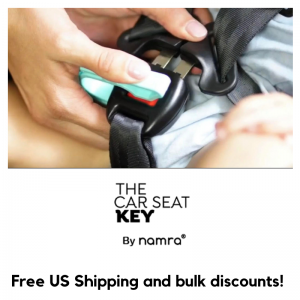 PLUS Free shipping if you get the pack. If you get some old stockings or socks, you can put the powder in there and play tag or any number of games. Add the powder to plain shaving cream (the cheap stuff is best) and use paintbrushes to paint garage doors, etc., or for an indoor party, use it as finger paint. In the summertime combine it with a splash party and get clean up included! The only negative … just because I want full disclosure … this IS dust. It’s a lot of dust. I worried a bit about my dad who has lung issues so he gets a dust mask for the activities that include throwing or squirting the dust at each other. And … it’s messy. While it’ll all wash off, some materials will likely hold the dust longer and need several washings. I would definitely not use this with a brand new coat, new jeans, new sneakers, etc., unless that’s something that’s included in the party (decorating your clothes). While we didn’t get a chance to use them, I had planned on having cheap rain ponchos for the kids in case their parents freaked out about the powder all over their clothing. Now that we did our multi-generational Thanksgiving with the kit, my 20-something kids and their friends are dreaming up all kinds of ways to have an at-home powder fun event. Watch here for more to come! Ready to have your own party? I received a party pack in exchange for an honest review. All thoughts are my own. If you’re looking for a great idea for a family adventure in the city, look no further! Enter Urban Adventure Quest. 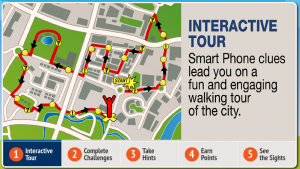 A smart phone guided tour, you and your family will walk through your city, find clues, solve riddles, and enjoy time together! Win win! You can do it competitively – comparing your score with others who have quested before you – or just for fun. One person gets the clues and is responsible for answering the riddles and challenges but others can be in “read only” mode as well so you’re not needing to hover over one small phone the whole time. Have trouble with one of the challenges? No worries! There are hints that you can choose to reveal if you find yourself stuck. It’s a great way to find out about various locations in your city too with interesting facts and tidbits at each stop. Such a great idea! After you purchase you can complete your quest any time that works for your family (during daylight hours of course). Give it a try! You can even see a demo on their website (click here) to see if it’s something your family would enjoy! My readers save 20%- Only $39.20 for a team of 2-5 people after Promotion Code: FGBLOG. Sign up online at www.UrbanAdventureQuest.com. I received a free trial quest in exchange for an honest review. All thoughts are my own. I really love this idea. Great for a homeschool adventure or small group or family fun! Turn your city into a giant game board with this fun scavenger hunt adventure. Combine the excitement of the Amazing Race with a three-hour city tour. Guided from any smart phone, teams make their way among well known and overlooked gems of the city, solving clues and completing challenges while learning local history. Play anytime during daylight hours. Start when you want and play at your pace. Great Family Fun. Save 20%- Only $39.20 for a team of 2-5 people after Promotion Code: FGBLOG. This is another great family board game, nike chaussures probably more suited to a little older kids with parents. Carcasonne is a fabulous family game that our family loves. When we first got it we’d play several rounds in an evening but I think we burned ourselves out on it (or at least some of us!) Now we play every other night or once a week and have a wonderful time. The game changes each time you play it and the strategy is exciting and fun, even for younger players. Super family game! Highly recommended. Wow. I just finished the last of a six part online course on marriage and family put out by Kirk Cameron with his wife Chelsea. They’re incredibly open and honest and the resources they include with the course are helpful. 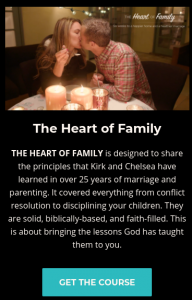 There are 6 videos, each about 20-30 minutes long with Kirk and Chelsea sitting in their kitchen and just sharing their hearts with very specific information to help you have a stronger, happier marriage as well as a solid, biblical relationship with your children as you are raising them. This course is the first of many upcoming courses (the second one is called Engage which is on technology and I’m 2 lessons in and it’s equally fabulous) that they’ll be offering but I really want to recommend it. Disclaimer: This course (and all of his courses) are unashamedly Christian in focus. The bible is central to each session and the basis for their advice so keep that in mind. So don’t be surprised by it if you decide to purchase the course. You heard it here first! Anyway, I wanted to pop over here and recommend it. I bought the course – I get nothing from them if you decide to purchase or anything like that. A young couple has just had their first baby but now lives pretty far away from their parents and the new baby’s grandparents. Every month, grandma/grandpa goes to the mailbox and gets an envelope with one or more pictures of the baby that they can frame or put in a little album to share with friends. air max soldes pas cher The couple only had to set up the account and the rest is done automatically. A college student is doing a semester abroad and posting her photos on Instagram for friends and family to see. nike air max 2015 But mom back at home not only can view the instagram account but every month she gets a gorgeous photo of her daughter at historic locations. 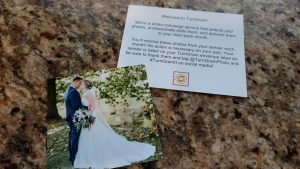 A wedding photographer has an instagram account to share some of her sneak peek photos of weddings that she’s shooting. Fjallraven Kanken UK Every month she gets a print photo in the mail to add to her portfolio to show to future brides and their families. A new dad works a busy job to provide for his family and isn’t able to see much of his new daughter during this season because she’s often asleep when he gets home. nike air presto pas cher Every month he receives a lovely photo of his precious baby that he can frame and keep on his desk to keep her top of mind and watch her grow up a bit. It’s really a great idea! You can get your first 30 days of TurnGram for free when you go to TurnGram.com. nike dunk Many thanks to USFamilyGuide for the sample TurnGram account so I could try the service for this review! I’m eager to get my next one. I’m guessing the biggest line item in your family budget aside from your mortgage, is probably the money you spend on groceries each month. Thankfully this one line item is one over which you have some control and can make a big difference as you evaluate where your money is going. nike sb Here are some tips: 1. Keep A Price Book: Love a bargain or a good deal? You’ll find them all over the store, but do you know if what they advertise as a good deal is actually saving you money? Here’s a great idea to help: keep a little notebook in your purse or keep a text document on your phone with the regular prices of the items you buy most often. Not only can you see if that “deal” really is a deal, you can also determine what kitchen staple is cheapest where and adjust your shopping accordingly. Your price book will also come in handy when you browse through weekly grocery flyers. You can decide if a loss leader deal is worth driving to the store long before you ever set a foot out the door. Fjallraven Kanken Sale 2. Make A Grocery Budget: This will take a couple of weeks if you’ve not been tracking your spending up until now. So for the next few weeks, write down what you are buying and from where. Get a general figure of what a normal month is cost wise. From there, come up with a weekly or monthly budget. Allot that money for groceries and whatever you do don’t go over. Cash envelope systems are a great way to track this. Or you can get a gift card from your grocery store in the amount you’ve budgeted and only use that card each time you shop. Fjallraven Kanken Classic Sale Next, try cutting back your budget by $10 per month. Keep going and see how low you can go. The remaining tips will help you do that without feeling like you’re depriving yourself. nike air max 1 3. Come Up With A Few Frugal Dishes: You don’t have to make drastic changes and eat nothing but rice and beans all week. Instead think of a few inexpensive dishes your family enjoys. They may be rice and beans. Or how about a big pot of soup or chili. Often meatless dishes will be your best frugal bet, or use meat in small portions on frugal dish days Enjoying frugal meals even just a handful of days during the month combined with using up any and all leftovers will make a big difference in your grocery budget. Ground beef is generally inexpensive and you can do so much with it these days to make it seem different each evening. 4. Cut Out The Extras: Make a list before you head to the store and stick to it. All those little extras like the fancy bread from the bakery or the candy you grabbed at checkout start to add up. Fjallraven Kanken Backpack Get in the habit of skipping those extras unless there’s a good reason to buy them. Stick to your list and you’ll cut your grocery bill by quite a bit each week. It’s amazing how all those little extras add up. Give these tips a try and see if you don’t start to see big savings on a weekly basis. What you do with all the extra money each month is up to you.